As an example kit to show off the flexibility of the new AddUser User Sign-Up and Registration features of XMod Pro 4 we have put together a pair of DotNetNuke user registration forms. Module Description: This Module Kit contains two XMod Pro Forms that are ready to use for DNN User Registration. XMod Pro Form AddUser tag - New to Version 4.0! The AddUser tag will register a user in the DNN site and optionally add that user to one or more DotNetNuke security roles after the form has been successfully submitted. UPDATE: HoneyPot For Bots - Added a few new example items to this registration form that are intended to help deterr bot submissions. HoneyPot Hidden Field - While hidden from human users the HoneyPot is irresistable to bots which will attempt to fill the field with some value. The field has XMP Validation which requires the field to be blank. The field is currently named "StateName" in this form kit, but can be renamed to anything else if needed. Additional Features: This XMod Pro Form Module Kit also includes additional signup-related features through jQuery and AJAX that help complete the user registration experience. Username jQuery AJAX Check - The form will check whether the username already exists, if so, a message is displayed encouraging you to pick a different username. 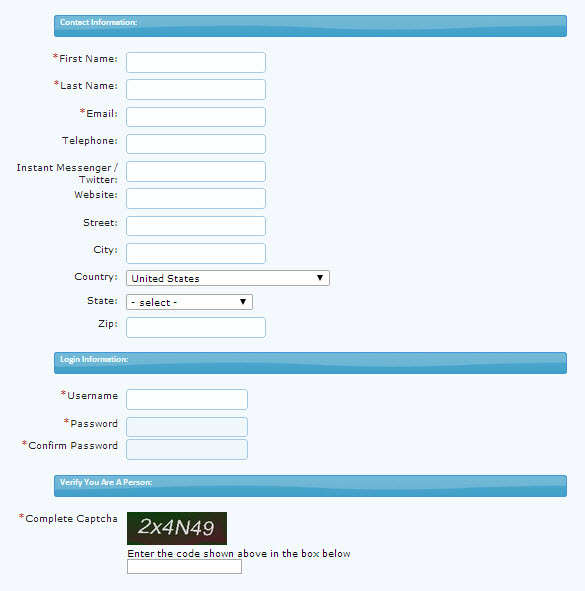 Email jQuery AJAX Check - The form will check whether the email address already exists, if so, a message is displayed and suggests the "forgot password" function for the user. 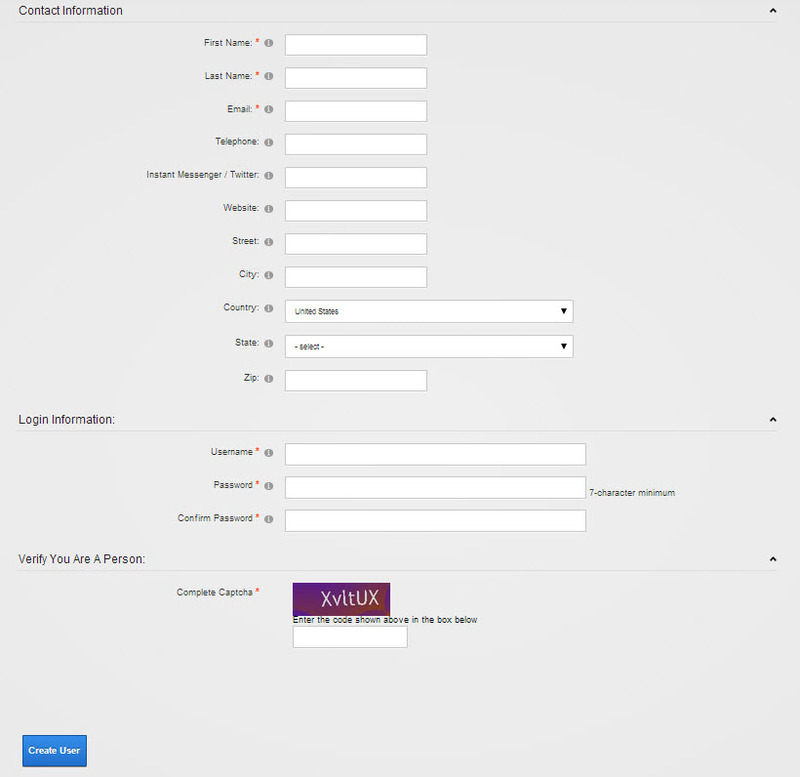 DotNetNuke User Registration Full Form - Also styled with jQuery Theme Roller, this is a more complete version of the user registration form that also includes additional user questions that are stored in the DotNetNuke User Custom Profile fields such as address, city, state, etc. DotNetNuke User Registration Full Form DNN7 Style! - The same as the previous one, but styled using the classes and styles of DNN 7 so that it matches the DNN 7 look out of the box! By placing this module on any page of your DotNetNuke website, you instantly get a complete and customizable User Registration solution for DNN. Use it on your main User Profile page for registration, or customize questions/fields and apply individual instances of the form code/module for specific types of user registration. The module code detects whether the DNN Portal is set for Public User Registration (in site settings) or whether another option is chosen. IF the site allows for public registration, then users are automatically approved/authorized. IF any other option is selected, new users created by these forms will automatically be set to "pending approval" or not authorized thus allowing for administrator audit of new registrations. This form code is ready to use once installed. However, it can be further extended with your own custom code to create additional features such as the ability to send additional email notices, save additional information in the database, and more! Consider adding the AddToRoles tag to the form to add different roles to the user based on specific questions answered during the signup process. Remember, as an XMod Pro module solution, you can easily add, enhance and extend the functionality! This XMod Pro Module Kit features several XMP Forms for use. 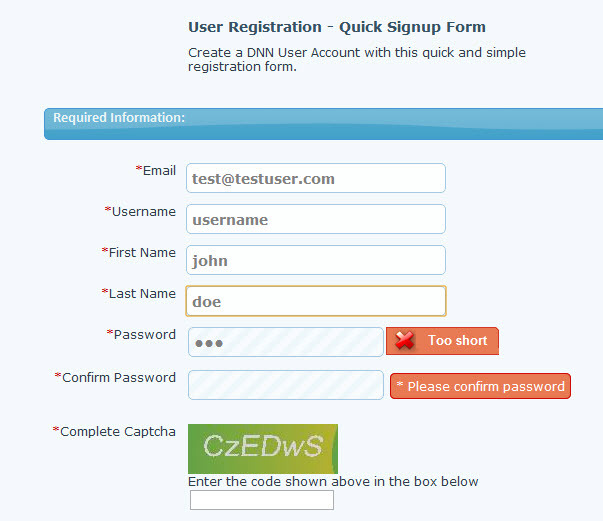 Create a DNN User Account with this quick and simple registration form.